Published: 7 December 2016 9:20 PM by Polo. So during the holidays, I followed my parents as they decided to walk around Cityhall and Suntec to shop for Christmas gifts for our friends and relatives. And yes, no one knows I've hidden my mom Charles and Keith Xmas present inside my backpack hahaha! My parents were not that hungry. However, I'm starting to feel ravenous so we went to search for a new place to eat. City Link is not a very big place but it is considered quite a distance because it stretches from city hall MRT interchange to marina square and Suntec city. 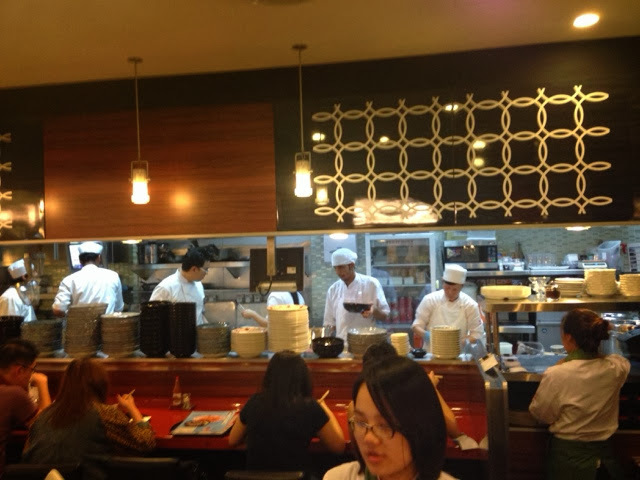 There was a wide range of outlet from Thai, American Quiznos to Sushi Express. So while contemplating and walking around for a good 30mins we decided to step into this Japanese Spaghetti restaurant called Yomenya Goemon. The queue wasn't bad and we don't have to wait long as it was already 7plus in the evening. Their service is very efficient from taking orders to clearing your plates after meal. But their cooking takes quite some time. One thing I've notice that they do not place any spoon / soup spoon on the table, just a pair of chopstick. So we ordered a Smoked Chicken & Three cheese for me . And since my parents aren't that hungry... they ordered a half and half meal which is rather unique. 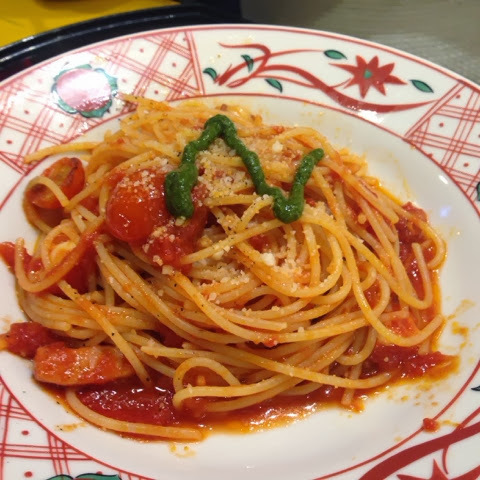 For example, my regular pasta is made with 380g of spaghetti . While the half and half is 190g and by adding the another half (you can choose a different selected spaghetti dish) 190g will give you a total of 380g. So if you are a small eater and would want to share, it will be great to go with this option. 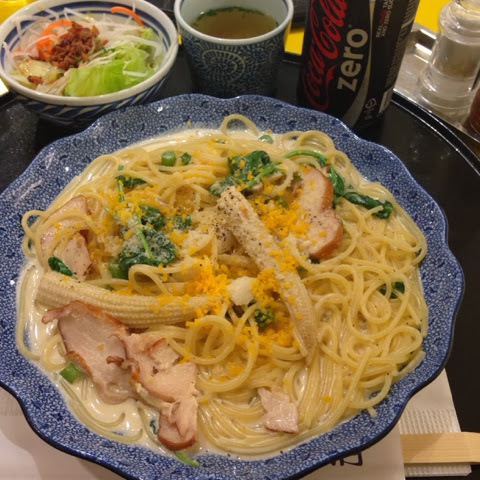 This is my spaghetti : Smoked Chicken & Three Cheeses , look at their generous amount of toppings and sauce. The amount of cheese they added is decent enough. Their miso soup between my coke and salad, yes no spoon so you drink it like a cup of tea ! 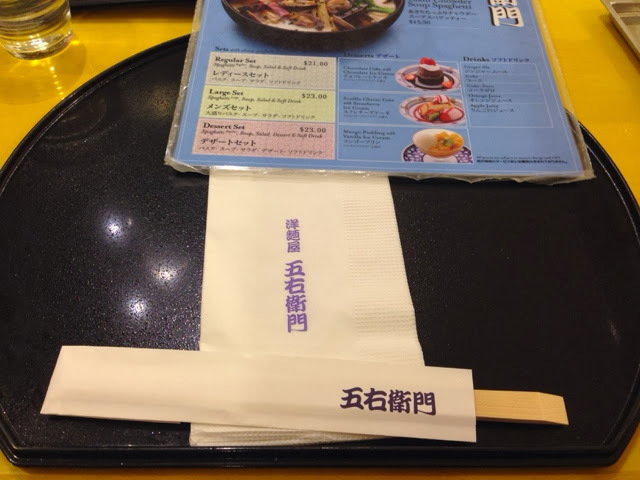 Their miso soup is neither thick nor salty, just right, and it's better than Yoshinoya's miso. 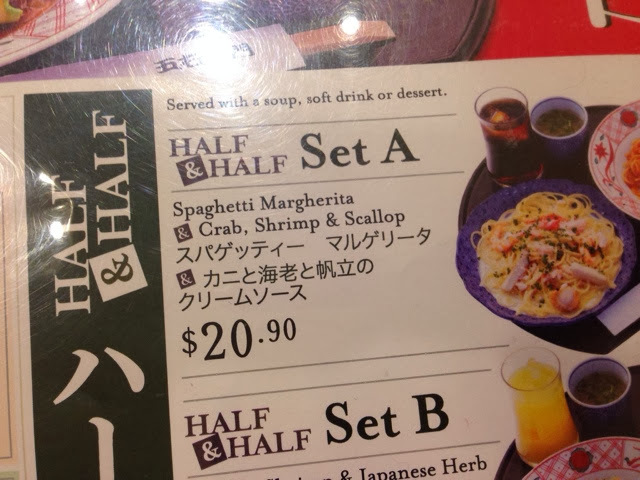 This is the half and half spaghetti which my parents ordered. Spaghetti Margherita and Crab, Shrimp & Scallop. 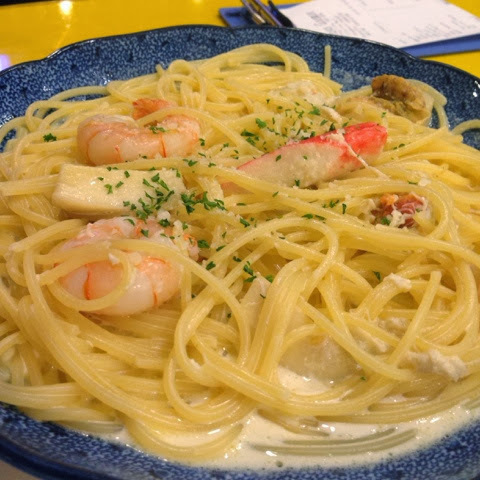 And I must say that this place serve brilliant spaghetti! But better than Pastamania? Well to me their spaghetti portion > pastamania's portion. Definitely be coming back to try their wide range of different flavourful dishes.